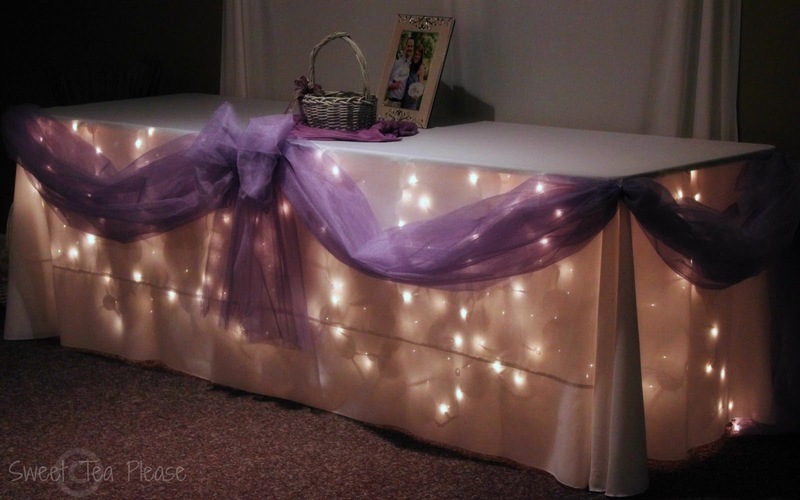 When a friend's daughter recently got married, she found this picture of a beautiful cake table on Pinterest. She asked me to help her recreate it for her reception. I, of course, agreed. As time for the wedding neared, I searched the internet for information on how to best do this. 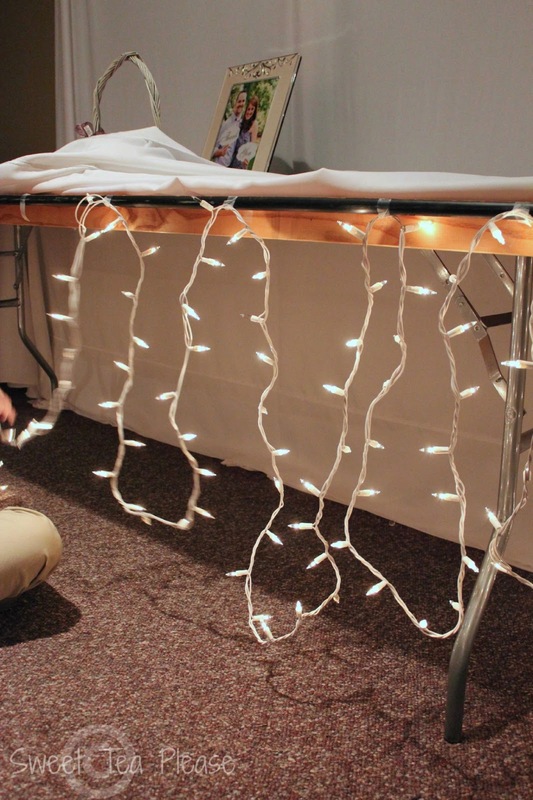 I was wondering what the easiest and most effective way to hang the lights under the table would be. Should the lights go under the table cloth or between the cloth and the tulle? Do they need to be pinned to the tablecloth or taped to the table? If tape, which would best hold the lights in place? But, alas! I could not find any tips or advice. There are plenty of pictures of this idea, but no specific directions about the best way to create it. So my friend Lindsey and I gathered our supplies and began the trial and error method. 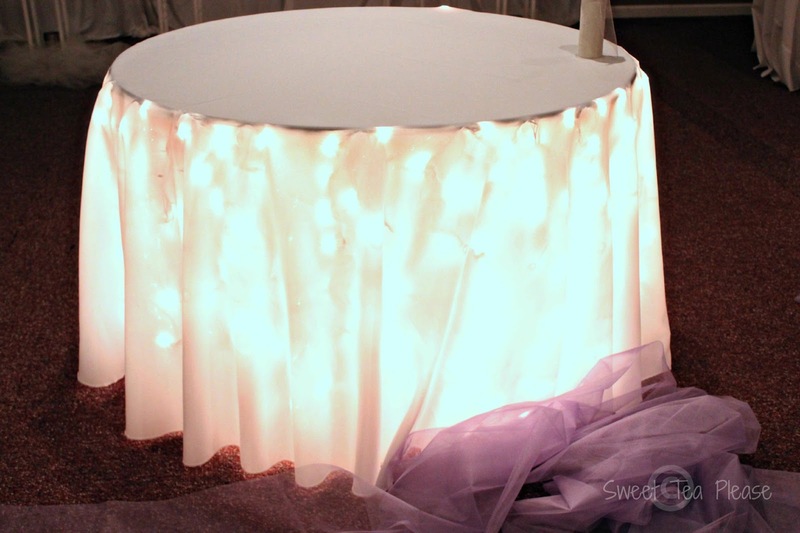 We decided that the lights would probably shine through the tablecloth alright and elected to tape the lights to the bottom of the table. We then discussed which type of tape would hold best. After deliberating, we decided to use Duct tape. We were wrong! It wasn't long before the strands began to fall. That trial was an error! We then decided to try a common transparent adhesive tape, and it worked. We taped the end of a strand of white Christmas lights to the underside of the table near the edge. We looped the strand down to the floor then back up again to the table, taping it in place. 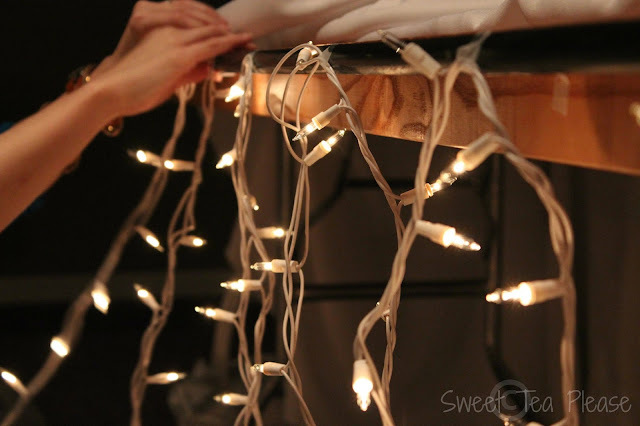 We repeated this until lights were taped all the way around the table. 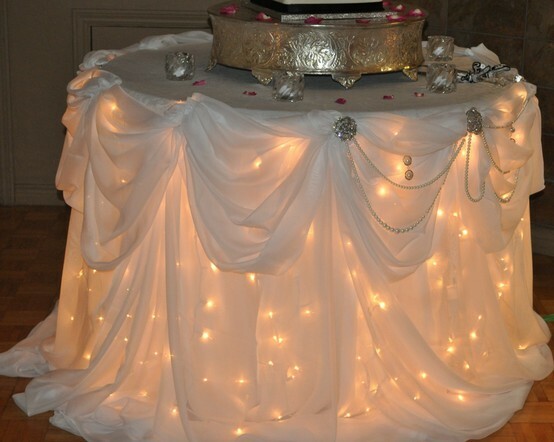 Next we covered the table with a white table cloth that reached to the floor. The light effect this produced was beautiful! 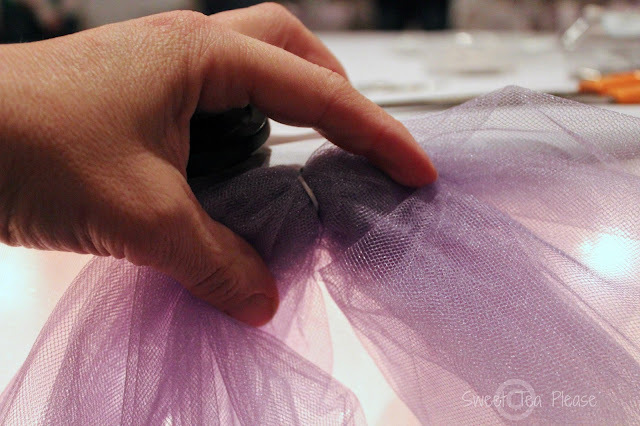 To further decorate, we added tulle in the Bride's colors and matching satin bows. 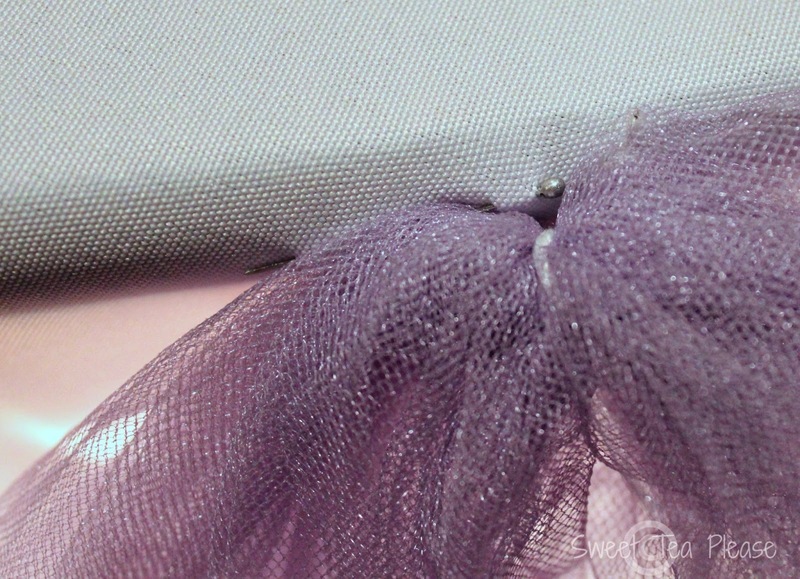 The tulle was gathered into a swag and wrapped with floral wire. 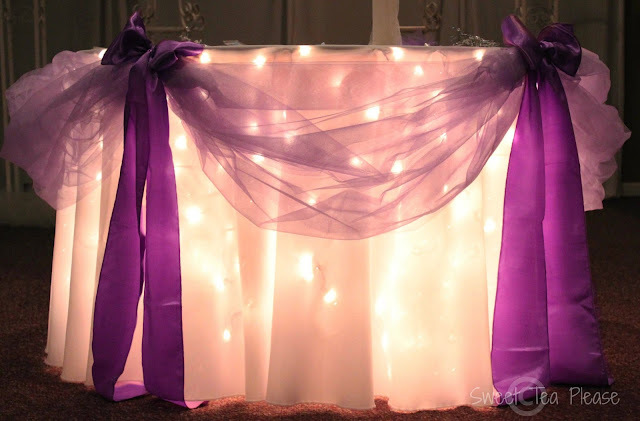 We then used straight pins to attach the tulle to the table cloth. Straight pins were also used to attach the satin bows. 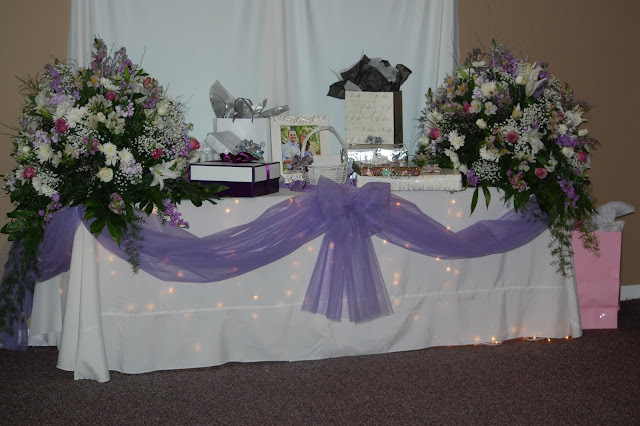 We used this method on both the Bride's cake table and the gift table. The results were wonderfully pretty and romantic. It was a perfect compliment to the beautiful winter wonderland reception the bride had planned. I did not take my camera to the reception, but a friend allowed me to post a couple of her pictures here. 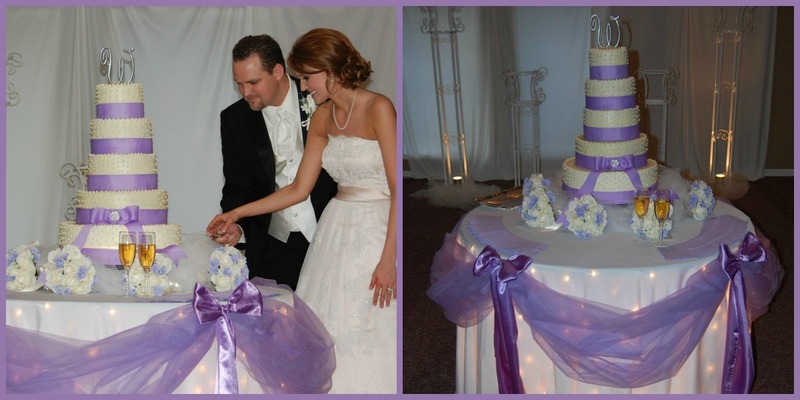 These photos show the tables bearing cake and gifts. 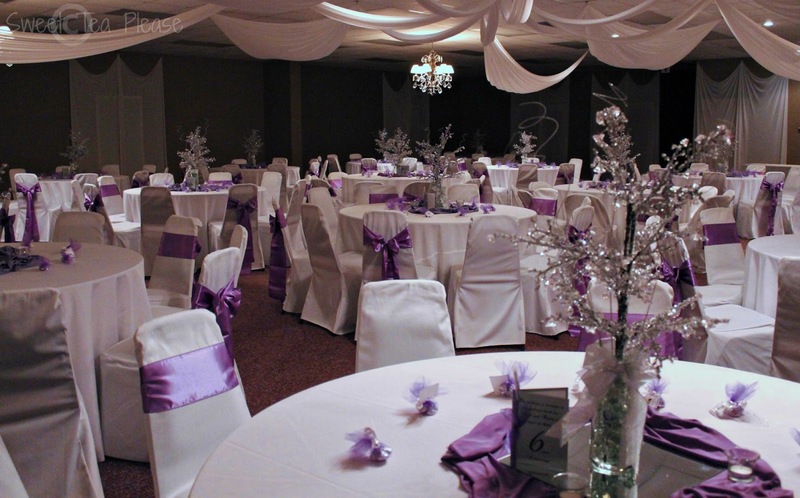 As a bonus, in case you are wondering what the reception hall looked like. Here is a photo before everyone arrived. It was fun to be a part of this wedding! 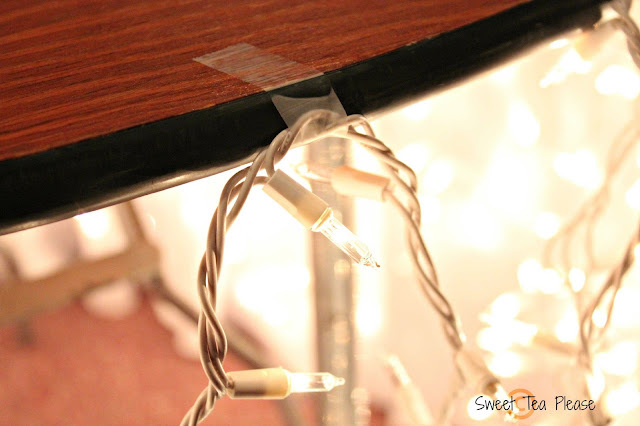 I hope our trial and error takes the guess work out of your next lighting-under-a-table project.